This stoneware mug features a cat warning "This IS my happy face". 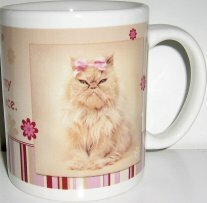 The words appear on the mug and the image of the cat is repeated on the other side of the mug. This mug is 3 3/4" high and it holds 12 fl. oz. Dishwasher safe, boxed.